Here at Horse Tack Now we strive to offer the highest quality Snaffle Bits available online. 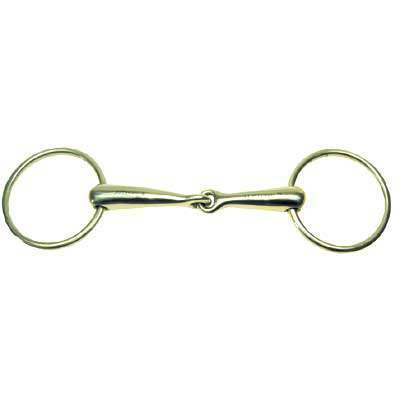 This German Silver Loose Ring Hollow Mouth Snaffle Bit is one of our most luxurious bits for your horse. This product features hollow mouth which help better divide the pressure delivered by the single joint creating the snapping action between the rings and mouthpiece. The german silver is very durable and will provide maximum durability even when used on a daily basis. The Loose ring feature provides a mouthpiece moving on the ring, leading to usual relaxation of the jaw and increase in chewing of the bit. The size of this item is 2/5'' rings and 21mm mouth. If you are in need of of a durable and luxuirous Snaffle Bit we have just what you need. We only offer the finest horse bits for your horses at unbeatable prices.